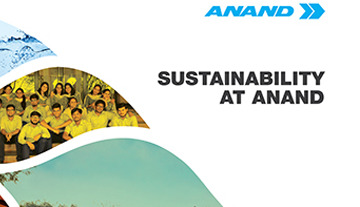 Sustainability at ANAND is about “Combining economic success with environmentally and socially responsible activities”. ANAND Group vision and sustainability values statement was released at a formal program held at the ANAND Corporate Headquarters on 6th March 2019, by Mrs. Anjali Singh, Group Chairperson, Mr. Jaisal Singh, Director, ANAND Supervisory Board and Mr. Deepak Chopra, Group Chief Executive Officer of ANAND. It highlights sustainability initiatives undertaken at ANAND Group. For information, please download the report.